Joined: Feb. 6, 2017, 8:32 p.m.
Hey fellow LEGO lovers! I am 15 and I like to build alternates for any LEGO set. I have really enjoyed using this site and being able to share my creations. Please give them a look and let me know what you think about them, or any way I could improve them. 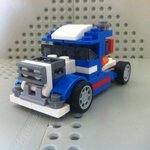 I also have a Lego Ideas﻿ account, and I would love it if you would support my MOCs on there. Thanks! Also, if you really enjoy my work and download a lot of my building instructions, I would appreciate donations of any amount to ﻿paypal.me/Turbo8702. Thank you!